I’m rekindling my love affair with food. Since the affair began years ago, we’ve had a passionate one but, as any affair, I might imagine, it has its ups and downs. Sometimes it cools down and looses its sizzle as I get overwhelmed with daily tasks and return to the boring and mundane and order mediocre take-out while on the go. I never forget about my love of food though. She sits there patiently waiting, often gnawing at the back of my brain with every artisanal loaf I spy in a bakery window or the ripe persimmons I pass by being sold from the street vendor down the block or the massive whole pumpkins that catch my eye in the market as they call out to me, simultaneously reminding me of the amount of time it takes to fully prepare one. Since the holidays have finished I’ve had slightly more time but have also still been busy with packing and preparing for our move towards the end of the month. I believe we’ve decided on Saturday, the 23rd. I’ve been trying to once again set aside time for my affair, either by the act of slowing down and performing the act of cooking itself, or by caring for my kitchen tools and utensils. After cleaning the kitchen countertops, I spent Saturday evening with the slow and meditative process of sharpening knives and oiling wooden cutting boards and spoons. While for some, it may be considered more “work” or “hassle” with items that need to be taken care of and maintained, for me, I’ve found, it’s enjoyable. I enjoy being very hands-on in the kitchen and being that way with my tools makes me feel more connected to what I’m doing. I like to believe I cook with love and that when I care for my materials, it deepens our relationship. Sometimes I wonder if the relationship I have with food now is strange or unusual, but as I’ve been reading more books like Poor Man’s Feast by Elissa Altman, or Notes from the Larder: A Kitchen Diary with Recipes by Nigel Slater, I’ve been feeling less unusual and more passionate. I’ve worried that Mr. C doesn’t have the same relationship with food as I do but overtime I’ve realized that while it isn’t the same, per se, he does have one and that it’s just different. The way I consider mine more of a love affair, I believe that his is more of a parental relationship- nurturing and simple. Unlike myself, with a mother recalls the entire decade of the 80’s as a blur and only consisting of work, and the 90’s not much different, he grew up with a mother who cooked each day and quickly had to learn to cook himself and help contribute and care for the family. He knew how to cook well before I did. When we started dating, he was really the one that taught me about actually cooking– that following a recipe exactly wasn’t the way to go. Taking recipes for inspiration and then going with the flow, changing things as you go based on what you have is really the way to work around the kitchen. For him it was easy; he’s lived around the kitchen most of his life whereas for me, the kitchen was a stranger that I had to learn to understand and become friendly with first before I could feel comfortable and eventually fall in love. With reigniting my love affair with food, I’ve been returning to the basics- returning to simpler foods and using less ingredients but creating more flavor. Despite it sitting in a pot on my windowsill, I regularly forget about using fresh parsley. 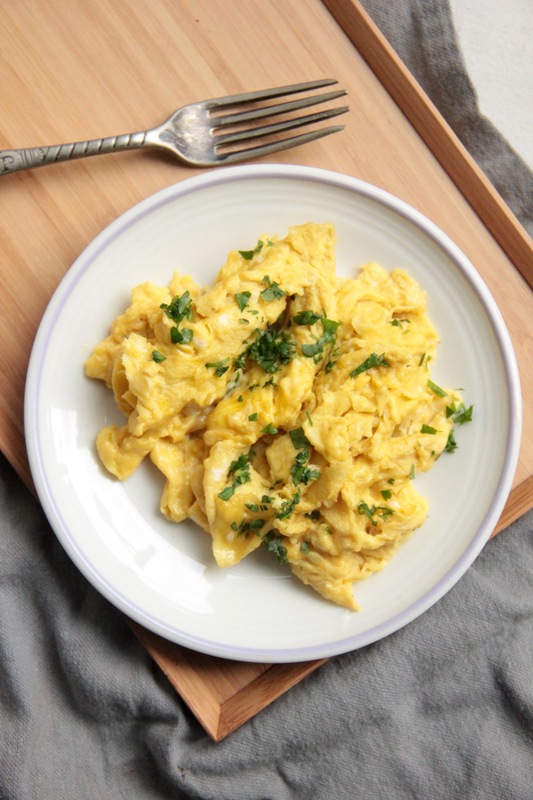 The tahini brings a nutty, slightly bitter taste to the eggs, while the parsley brightens it up and balances it out. 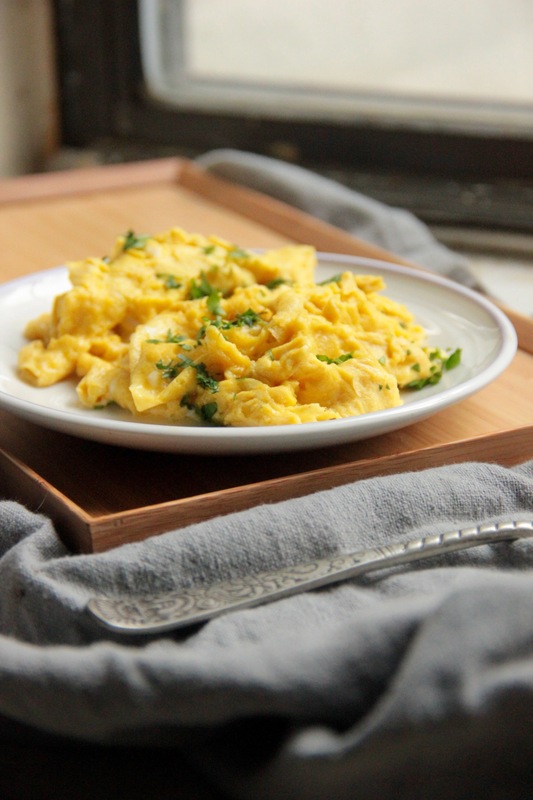 Scramble the eggs, tahini and a pinch of sea salt in a bowl. With a medium sized skillet, set the stove top to medium high. Add the exact amount of 1 hunk of butter and allow it to melt and start to bubble before turning to medium low and adding a dash of olive oil. Swirl the skillet around a bit so that the butter and oil coats the pan and add the tahini eggs. 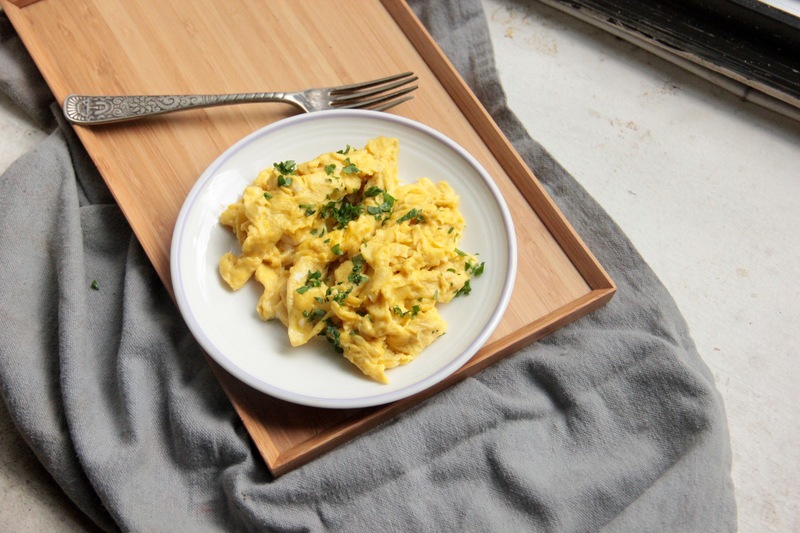 With a wooden spoon, push the eggs around occasionally until they are almost done with a slight shimmer to them. Remove from the pan and divide between two plates. Serve with the minced parsley on top. 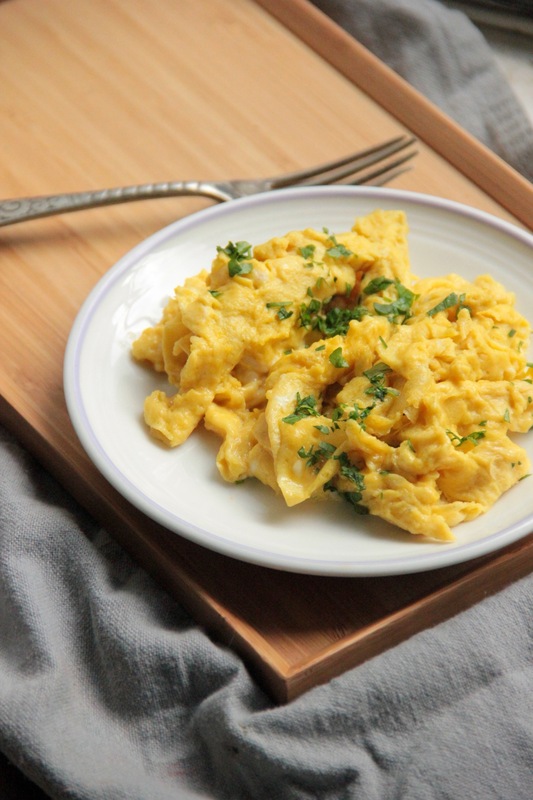 Never thought about adding tahini to scrambled eggs – this looks delicious! These look great! I love the idea of adding tahini! You’re speaking my language. Remember “Killing Me Softly” by The Fugees? Your words felt like that haha. We’d get along famously I think. And this recipe is totally my style as well. I wish I had parsley in the house so I could make this right now. And I’m absolutely thrilled that you made my recipe 😀 Thank you! Oh yeah! I’m glad I came across it! I’ve never thought of adding tahini! What a great idea! This looks simply delicious! Adding tahini is such an awesome idea, I have some tahini lovers in my life who would loooove this! Thank you- tahini is such a wonderful ingredient! I hope your tahini-loving friends like the idea! Adding tahini is a great idea, I need to try it.